Bavarian Herb Soup (Krautsuppe) - Bitter herbs are traditionally eaten at Easter in Christian countries as a sign of penitence. 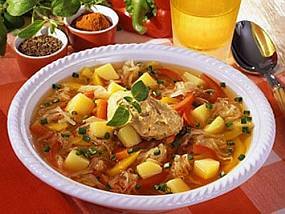 This Bavarian soup is served on Easter Thursday, known as Maundy Thursday. Fresh chervil, easily available in any German market, is usually the dominating flavor. This is a delicate fresh-tasting soup for any time of the year. You will need a large saucepan. Pick over and wash the herbs, stripping the leaves from those stalks which are too woody. Chop the rest. Melt the butter in a deep pan and fry the onion gently until get transparent. Add the herbs and sweat them for a moment before you pour in the water or broth. Add the potato to the soup. Bring thesoup to a boil, and then turn down the heat. Mash the potato in the soup to thicken it a little. Taste, and add salt and freshly milled pepper. Serve with bread croutons fried in butter or bacon fat (goose fat is even better). They should be so hot that they sizzle when they are added to the hot soup at the table.